Paper, Lace and Buttons. : Hark the herald Angels sing! I simply adore vintage style and this stamp from Reprint, available at Swedish House Crafts is really so sweet and screams Christmas. 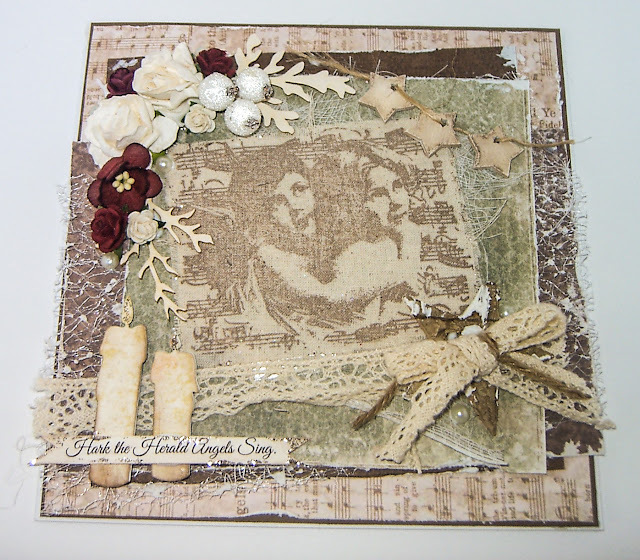 I decided to stampt the image using versafine onto calico fabric and seal using colourcraft pearl powder clear binder with a sprinkling of glitter. ( using clear binder makes this ideal for use on home décor such as cushions, hangings or even bags). Materials also used include;- pearls, lace, papers from Maja design, die cuts, cheesecloth, lasercut chipboard and stickles. Sentiment from Pc. Flowers , Bark stars from stash. Would love to enter into the following challenges..
craftygalscornerchallenges.blogspot.co.uk/ theme # 132 Christmas in July.